Sweet Meat… – Eat, Drink, and Go! One of my favorite flavor combinations is sweet and savory. This is why I love to make a sweet sauce for a savory piece of meat. One of the first dishes I made well as a grown up was basically just about the sauce because I could do it with steak or chicken. It was a blackberry Merlot sauce where I reduced the wine with blackberry jam until it was a thick glaze. It really wowed ’em! 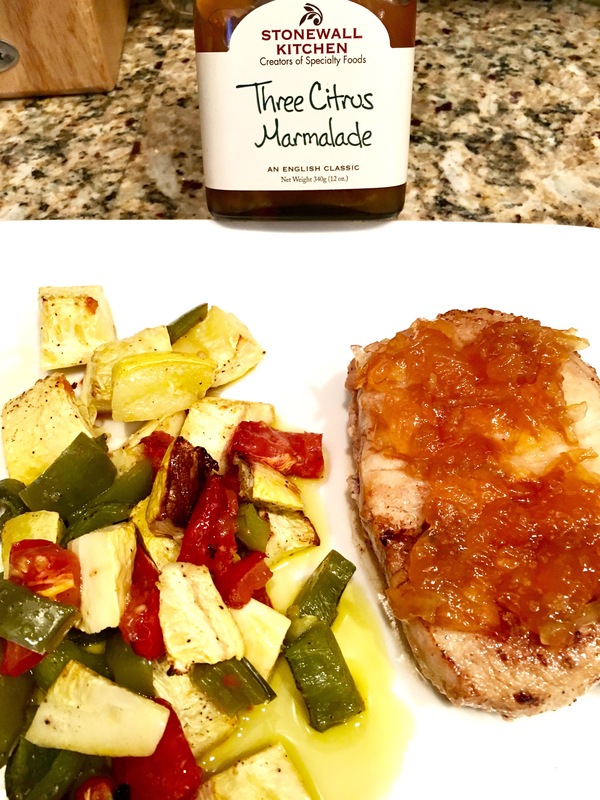 Last night, I made pork tenderloin with roasted summer squash, peppers, and tomatoes. The trick to this pork, I’ve recently discovered, is brining it for a few hours in the fridge. I placed the cutlets in a Ziplock with some white wine, water, brown sugar, smoked salt, and rosemary salt. Then I sauteed (sort of braised since there was a good amount of liquid, but at a higher temp so it was boiling) it in the brining liquid for about 4 min on each side. Then I took the cutlets out of the pan, removed the remaining liquid, then seared them off in butter. I like to call it a reverse sear because their already almost cooked when I do this and usually you sear things first. I don’t play by no kitchen rules, na’mean? It came out perfect and then I made it even better by smearing on some Stonewall Kitchen’s three citrus marmalade. The sweet marmalade set of off the salty brine just beautifully!! It was definitely a happy dance of flavors in my mouth. I love all of the Stonewall Kitchen jams. They truly “jam” with all the food I make or even just with a good cheese (I can’t have a cheese plate without something fruity). That has to be why it’s called “jam.” One of my faves is their maple bacon onion jam. If you haven’t tried it, you must! !